Mini Distress inks & Imagination Rice Paper 010. I blended mini Distress inks - Peacock Feathers, Twisted Citron, Spiced Marmalade & Picked Raspberry - on white card, then glued the rice paper on top, using Magi-Bond glue. When it was dry I trimmed the excess & applied a little Peacock Feathers around the edges. I stamped the Crealies stamp no. 42 with Versamark, covered the ink with WOW! Gold Rich embossing powder and also sprinkled a little EP over the rest of the surface. I heat set from underneath so that the loose powder wouldn't blow away. I tore out the butterfly from another sheet of Rice Paper 010 & glued it to white card. When it was dry I cut it out, added some WOW! 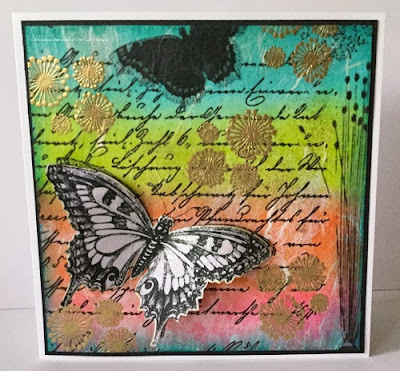 Clear Sparkle EP to a few areas - using a Versamark pen, shaped it & adhered it to the base, which I then added to a black layer & a 7x7 white card blank. Class Day is this coming Friday, August 5. More information HERE. That's it from me for now, thanks for looking, have a great week. 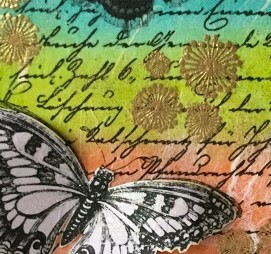 Labels: craft classes, Crealies, Distress Inks, Imagination Crafts rice paper, Lisa B Designs, Maidstone, WOW!